From small beginnings above a pub in Chelsea in 1995, Andrew has recruited a fabulous team which, under his leadership, make bridge uniquely fun, friendly and non-threatening. At its heart, ARBC is a teaching Club and Andrew has devised all the courses and is constantly fine-tuning them. You will see Andrew most Tuesdays, some Wednesdays and at other odd times when he is not running charity events and master classes around the country, playing tournaments or writing his daily Times column or weekly for Country Life and Money Week. 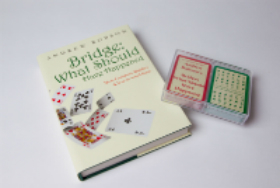 Andrew has written over 25 books on bridge and also constructed our three ever-popular flippers: Beginner, Essential and Conventions. To read more about Andrew click here. Whether making sure the Club runs smoothly, supervising beginners, or playing at the top level, Nick's efficiency, plus his clear-thinking and logical approach and his love of the game, always shines through. Nick, a man of vision, is a great asset both to the main Club and to our offshoot in Notting Hill which he runs on Wednesdays & Thursdays mornings. Crisis – what crisis? Martin’s affable and calming presence, his smooth directing and helpful supervising, make him an integral member of staff and universally popular. An accountant by training, Martin's administrative skills behind the scenes are invaluable. Richard is the main teacher of our weekend courses, and an inspirational one. Whether teaching, directing or supervising, Richard's easy, relaxed manner ensures a happy time for all and it is hardly surprising how universally liked he is. David is a teacher par-excellence and has worked at the Club for over fifteen years. He has such a clear, yet relaxed style, that his students rave about his classes - and invariably come back for more! David has the rare talent of being a brilliant teacher and a top player. David is a regular member of the English Bridge team. Grazyna's bubbly optimism lights up any table. She is a very talented player as well as a brilliant supervisor. Come on Tuesday or Wednesday eveninsg to our Supervised Play – or to the many other sessions she makes so worthwhile - and you’ll find out why she is valued so highly. Our ever-genial host on Friday nights, Paddy is now a full time member of staff, which is delightful for the Club. Whether he is teaching or supervising, he makes you feel so comfortable you could be in your living room. And what a brilliant memory for names! Our fabulous efficient bookkeeper who is so much more than that. Nicky is the only member of staff who has ben with Andrew since the very beginning in 1995 – even Caroline came year later. Jack has been running Andrew Robson Bridge Holidays for the last ten years with his wife, Annabel. Jack worked for seven years at ARBC before moving to his native Yorkshire and is regarded as one of the country’s leading bridge teachers, known for his sense of fun and clarity of teaching. 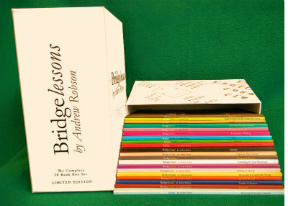 Click here for current bridge holidays. Son of the England Ladies star Nevena Senior, Kiril has a natural talent for the game and aspirations or climbing to the very top. He is a friendly and clear supervisor too. A former England Junior Squad member Pip can be found running many of the club duplicates. With aTest Text Test Text sharp wit and even sharper logical mindset, he is the go to for a plethora of questions ranging from, "How should this hand be bid?" to, "How do I put my phone on silent and by the way what’s the cricket score?" Angus is a really fine Bridge player and an enthusiastic supervisor: he is always willing to turn his hand to any task. We are delighted to have him on the team. Natasha, always gentle and enthusiastic, is a teacher by training, as is evidenced by her great communication skills when supervising and teaching. Recently married, she is really looking forward to teaching more again soon. A legendary figure. Father of Jack, Simon and Zeb, who have all had long stints at the Club, Peter is a jigsaw-puzzle maker from Yorkshire, always lending a willing hand when he can find an excuse to come down to London. Win the Tuesday-Thursday evening Ladder and you are the holder of the Stocken Cup, named after the family that has had so much involvement in the Club.